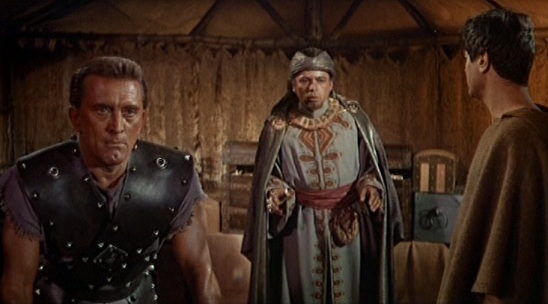 Spartacus (1960) is proof that the Star Wars prequels could have been contained in one film. And they probably would have been much better if they had. Just imagine, we could have gone back and seen the birth of the Republic, epic Jedi vs. Sith battles, an explanation of who the Sith are, and a proper telling of the Clone Wars, and still had plenty of time to tell the story of Anakin Skywalker’s rise and fall. That would have been incredible! This isn’t the first time I’ve talked about the Star Wars prequels. A while back, I listed all the things I like about them. This time, I don’t intend to mock them, but I will show how they could have been better by comparing them to a superior film. I’m writing this in part to show that I don’t hate all of Stanley Kubrick’s movies after what I wrote in my last article, “6 Movies That Are Better If You Skip the First Half.” I’m not a fan of 2001: A Space Odyssey, but the man was clearly able to tell stories that are both linear and gripping. He didn’t need to resort to excessive visual extravagance. But the problem with this article is that it’s likely to upset some Star Wars fans. So I guess I’m par for the course when it comes to offending my patient readers. With that said, let’s delve into the Star Wars prequels vs. Spartacus! I want to stress that I’m not saying Spartacus and the Star Wars prequels are exactly the same. What I am saying is that they have a lot of similarities in their plots and characters, which I will highlight along the way. The Star Wars prequels are basically about how a good man turns to evil amid the backdrop of a republic turning into a dictatorship. Spartacus is about a man who fights for freedom and loses amid the backdrop of a republic turning into a dictatorship. Clearly, there are a lot of connections between these plots. The first part is about slaves being freed. The second part involves forbidden love. Senate politics play a big part in the stories. A monarchy is set up under the pretense of crushing a group of separatists. The main character gets a frightening peek into the future. The separatists are betrayed and left to die. Children are killed during a bloody battle. Longtime friends must fight each other to the death. The former leaders are exiled by the new government. The hero’s children escape unharmed. The first act of Spartacus roughly translates into Star Wars Episode I: The Phantom Menace. The point of The Phantom Menace is to show how a young boy named Anakin Skywalker is freed from slavery and joins the Jedi Knights, as well as to introduce us to some intergalactic politics that will become important later. 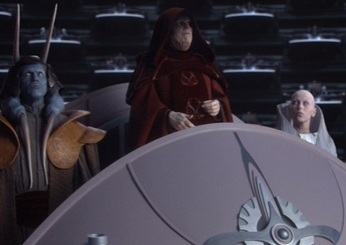 While the main characters are busy handling a crisis, a slimy politician named Senator Palpatine makes a deal with Padme Amidala (who is the Queen of his planet) to get himself elected as Supreme Chancellor of the Senate so he can later become a dictator. Spartacus begins with the titular slave being sold to a gladiator trainer who molds him into a fearsome warrior. One day, a member of the Senate named Crassus visits the gladiator training center and has Spartacus battle one of his fellow gladiators. During the fight, Crassus and one of his friends talk about Roman politics and make a deal that will eventually propel Crassus to a dictator. After his brush with death in the arena, Spartacus finds the courage to stand up to his masters and win his freedom, along with all of his fellow gladiators. In The Phantom Menace, a Jedi named Qui-Gon Jinn has a rather flippant attitude toward slavery on the planet of Tatooine. He meets a slave named Anakin, but when he hears the boy’s plight he simply says he didn’t come to the planet to free slaves. He strikes a bargain for Anakin’s freedom only because he thinks it will benefit the Jedi Order. 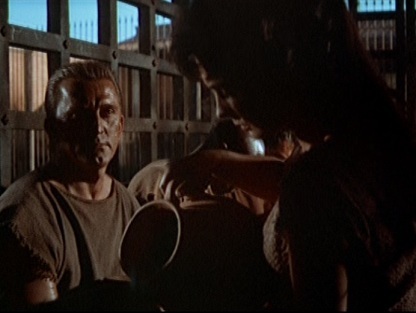 Slavery is treated as a more serious problem in Spartacus. In fact, it’s at the very heart of that movie’s theme about the need for freedom. An aspect of Spartacus that coincides with both The Phantom Menace and Star Wars Episode II: Attack of the Clones is a budding romance. Spartacus meets a young woman named Varinia, but they are forbidden to be together. Despite the efforts of their masters to keep the two apart, they manage to secretly hold hands, whisper a few comforting words to each other and share meaningful glances that tantalize the audience and make us wish they could be together. The first two Star Wars prequels, however, fail to get the audience interested in the forbidden love of Anakin Skywalker and Padme Amidala. 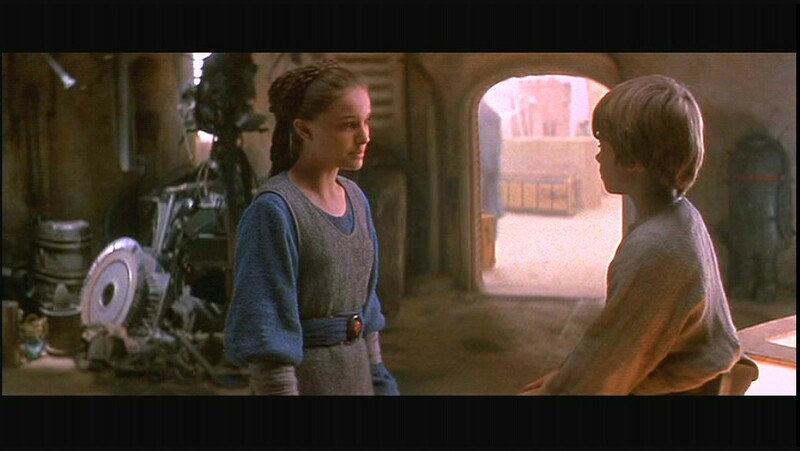 In The Phantom Menace, they are both children, and the scenes they share together are awkward. We’re not even supposed to know that Anakin is interacting with Amidala because she’s disguised herself as a handmaiden to the Queen. The two are given every opportunity to be together and fall in love in Attack of the Clones. They’re ordered to be alone together in picturesque locations that seem designed to be as romantic as possible. While Spartacus’ and Varinia’s love grew in the worst of circumstances in the dark bowels of a prison, Anakin’s and Padme’s love grew in idyllic circumstances and locations. They could say all they want about the Jedi being forbidden to fall in love, but there’s no real tension there because it’s not like they live under the threat of death if they disobey that rule. They would just be inconvenienced if others found out about their love. Oh, politics. They’re so hard to show in films without either slowing down the film’s pace (see RoboCop 2) or lacking any kind of drama or interest (see Batman Returns) (or better yet, don’t see those movies and save yourself the trouble). Somehow Spartacus manages to show an extremely complex series of behind-the-scenes politics in a way that is both riveting and integral to the story. All three Star Wars prequels have a great deal of intergalactic politics going on, but they’re quite vague and dull. In Spartacus, Crassus, a leader of a Roman Garrison and a member of the Roman Senate, unwittingly sets into motion a series of events that he later takes advantage of to propel him to dictator of Rome. Despite a series of setbacks, such as his friend’s army losing a key battle against Spartacus’ army and Spartacus being seemingly unstoppable on his march to freedom, Crassus never gives up. He finds a way to twist failures into victories by preying on his fellow Senators’ sympathies and his enemies’ greed. 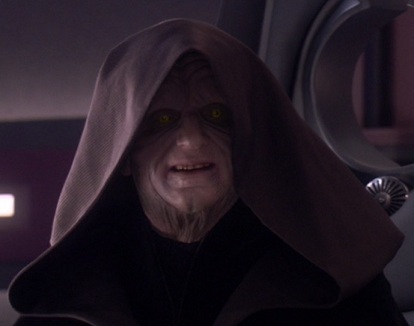 In the Star Wars prequels, Senator Palpatine sets up one conflict after another to move him closer to his end goal of being named Emperor. First, he gets the Trade Federation to invade his home planet of Naboo to generate sympathy for himself in the Senate and get him elected Chancellor. Then he uses several puppets to create a group of separatists and a clone army to fight them. He never runs into any snags on his journey. Sure, the Naboo people defeat the Trade Federation, but he’s already achieved his goal by the time that happens. It seems like there’s no credible threat to him the whole time he’s hatching schemes. The Jedi are all blind to his powers until it’s too late, and the rest of the Senators never stand up to him or challenge his extreme measures. That seems unrealistic in a body representing hundreds of worlds and which is described as always arguing about the right thing to do. Early on, Spartacus and Anakin get a taste of the bitter future that awaits them and the ones they love. A Salician pirate named Tigranes Levantus offers Spartacus and his slave army safe passage by boat far away from the Roman Army. Spartacus happily agrees to Tigranes’ terms. But the pirate suddenly shares a sobering prediction, “Surely you know you’re going to lose, don’t you? You have no chance… If you looked into a magic crystal and saw your armies destroyed, yourself dead – if you saw all that in the future, as I’m sure you’re seeing it now, would you continue to fight?” Spartacus replies that yes, he would. Death is preferable to slavery in his view. In Star Wars Episode III: Revenge of the Sith, Anakin has a nightmare of Padme suffering and dying, so he tries to do everything he can to make sure that doesn’t happen. However, all of his efforts wind up causing the very thing he was trying to avert. There’s an air of inevitability to Revenge of the Sith. We, the audience, already know that things will end poorly for all of the characters because we’ve already watched the sequels. Seeing Anakin’s dream makes the future seem almost predestined, though. I prefer how The Empire Strikes Back portrays seeing the future. Yoda and Luke see visions of what may happen, but we don’t, so we’re not sure if those events will actually happen or if there’s a chance for Luke to make a difference. That’s a lot like how Spartacus presents the future. The freed slaves are hopeful about their chances of success, even though everyone else thinks they’re crazy. We want them to succeed, so we’re willing to overlook the odds against them until the bitter end. The goal of Crassus and Palpatine is the same: to create a dictatorship. But their reasons for doing so couldn’t be more different. Crassus’ intentions are entirely clear the whole time. He wants to save Rome, and he thinks the best way to serve her is to do whatever is necessary, even if it means taking extralegal actions. He’s a complex character, yearning for power but hating it at the same time. In the end, you get the sense he is displeased with what he has become, but he has no intention of changing his course. He did, after all, save his civilization and culture, though it came at a heavy price. Palpatine, on the other hand, has vague reasons for seeking power. In fact, most of the problems with the Star Wars prequels come down to the fact that they’re too vague. The characters have no memorable attributes, the stories are full of undeveloped ideas, and there’s just a nagging feeling that the movies are missing the point of what Star Wars is all about and what the audience wants to see. But I digress. Returning to Palpatine, he says that he wants to take revenge for some past wrong that was inflicted on the Sith by the Jedi. But what is a Sith? What did the Jedi do to them? How did they resurface? Who is Palpatine and where did he come from? I would have loved to have seen a prequel that answered those questions rather than one showing a trade dispute. Palpatine claims he has the power to bring the dead back to life and do other unnatural things in order to seduce Anakin to the Dark Side of the Force. Can he actually do those things or is he just bluffing? I wish I knew. All I know is that I still don’t have a clue what makes him tick. A devastating betrayal leads to a terrible tragedy in both films. In Spartacus, the slave army is abandoned by the Salician pirates who fail to deliver the ships as promised. So the slaves are forced to fight two vastly superior Roman armies. They are unable to pull off a victory and nearly everyone is killed. In Revenge of the Sith, both the Jedi and the separatists are betrayed by the Sith. Under Order 66, the Clone Army turns on the Jedi and kills all of them except Yoda and Obi-Wan Kenobi. Once that’s done, Emperor Palpatine sends Anakin (who has become a Sith Lord named Darth Vader) to the separatists’ headquarters to kill all of their leaders. It’s a bloodbath, and there are virtually no survivors. The betrayal in Spartacus is much more affecting than the one in Revenge of the Sith. We’ve spent a lot of time with these slaves, and there’s something inspiring about watching people fight for freedom against incredible odds. But we don’t really get that sense of people fighting for freedom or doing much of anything besides trying to preserve some vague (there I go using that word again) sense of liberty in the Star Wars prequels. We barely even get to know the characters enough to care about their deaths. Innocent children are killed by both Crassus and Emperor Palpatine. Crassus knew he was fighting more than an army of slaves; he was fighting the idea of liberty and justice for all. He had to kill the perpetrators of the treason against Rome and anyone else even remotely connected to this insurrection so that their voices would be forever silenced. 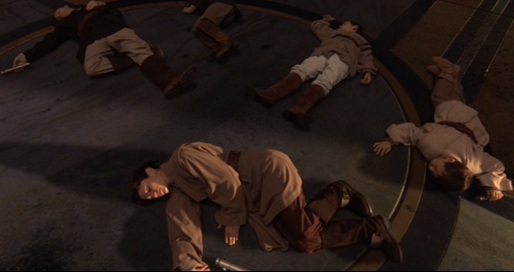 The children who were being trained to become Jedi, of course, had to be killed so the Emperor could solidify his power over the Galactic Republic. There could be no traces left of the Jedi’s influence or any way for them to return. However, it seems like in a galaxy where anyone could be born with Jedi traits then trying to keep the Jedi extinct would be like playing a game of Whack-a-Mole. Kill one generation of Jedi and a new one is sure to pop up sooner or later. The Emperor’s position of power would always be tenuous, at best, which I suppose is probably why he felt a need to build an ultimate weapon (the Death Star) to strike fear into his subjects. Spartacus and Anakin are forced to fight with an old friend. The ragged survivors of the battle with Crassus’ army are crucified one by one on the march back to the city of Rome. Spartacus and his friend Antoninus are saved for the last. They’re placed in an impossibly cruel situation in which they must fight each other like gladiators and the winner will be crucified. This is the height of drama. Spartacus begs Antoninus to lay down his sword and let him deliver a killing blow that will be swift and painless. But Antoninus refuses and does his best to kill Spartacus, hoping to spare him the torturous death by crucifixion. But he’s no match for a trained gladiator like Spartacus and he quickly falls. 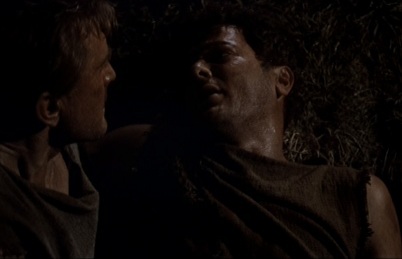 As Antoninus dies, he expresses his love for Spartacus as a son loves his father, and Spartacus says he loves Antoninus like a father loves his son. It’s truly heartbreaking. After learning of Anakin’s atrocities against the Jedi, Obi-Wan tracks him down on a lava planet, and the two have an emotionally charged lightsaber duel. They are equally matched in lightsaber skill, though Obi-Wan has more control over his emotions than Anakin. The fight starts off well with a lot of unpredictable moves, but it drags on several minutes too long. It becomes less about the lightsaber battle and more about simply surviving all the lava and other pitfalls on the planet’s volatile surface. Obi-Wan takes advantage of Anakin’s brazenness to deliver a nearly fatal blow. However, his love for Anakin prevents him from ending his life, even though Anakin is completely helpless and burning to death. I don’t know if it’s kind or cruel to let someone suffer as much as Anakin does. Anakin screams out his hatred for Obi-Wan as Obi-Wan proclaims his regret at Anakin’s fate. The fight between Spartacus and Antoninus is better than the one between Anakin and Obi-Wan. It’s shorter and it’s more tragic because we are seeing two people who are only fighting because they want to allow the other to escape an even worse death than one by the sword. 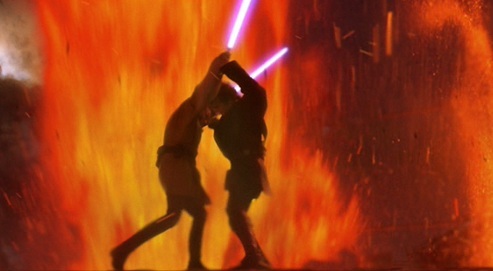 The lightsaber duel in Revenge of the Sith tried to be great, but ended up only being decent. The leaders who oppose the dictator’s rise to power are banished and have all their governmental power stripped. 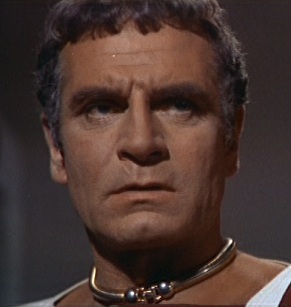 In Spartacus, Gracchus is the main Senator who stands up to Crassus and tries to thwart his power grabs at every turn. However, once Crassus crushes the rebellion and cements his power over Rome, he puts Gracchus in his place and makes him a puppet of the new dictatorship he has established. Even in exile, however, Gracchus makes plans to fight Crassus, as we’ll see in the next section. In Revenge of the Sith, Yoda is the only member of the Jedi leadership to survive the Emperor’s genocide. After unsuccessfully trying to kill the Emperor, he is forced to run for his life. Yoda and Obi-Wan go to different planets to wait for Anakin’s children to grow old enough to take up the Jedi mantle. It seems like an excessively passive course of action. What if Leia failed to deliver a message via R2-D2 to Obi-Wan or if Luke was killed by the Sand People? A lot of things could have gone wrong on the path to defeating Darth Vader and the Emperor. And there’s another key difference between Spartacus and the Star Wars prequels. After they are betrayed, Spartacus and his fellow commanders are offered a chance to sneak away and leave their fellow slaves to be killed. But they flatly refuse. After all, what kind of heroes would desert their people, even in the face of certain death? And yet, that’s exactly what Yoda and Obi-Wan Kenobi do. Kind of odd. I’ve barely mentioned Varinia and Padme in this article. But they do play an important role in these films beyond just being love interests. They both give birth to children, and their husbands are worried they will never see them. Spartacus is deeply depressed because he thinks Varinia and his son were killed in the battle. However, they manage to survive and are sold into slavery to Crassus. Through Gracchus’ political maneuvers, Varinia and her baby boy are granted their freedom. As they make their escape, they come across Spartacus who has been crucified just outside Rome’s gate. Unable to speak or even smile because of the excruciating pain he is in, Spartacus is nevertheless able to die in peace knowing that his wife and son are safe and free. Even though everything Anakin did (killing children, betraying the Jedi Order, etc.) was to save Padme, he tries to kill her just before he fights Obi-Wan. Anakin is saved from the lava planet and goes through a painful process to be reborn as a man-machine hybrid, Darth Vader. He has no clue that Padme survived long enough to give birth to twins – Luke Skywalker and Leia Organa. There’s no time to deal with this dramatic turn of events in Revenge of the Sith, but it plays out beautifully in the next three films, especially Return of the Jedi. When Darth Vader lies dying after redeeming himself, it’s so powerful to hear him beg Luke to take off his mask so he can see his son just once with his own eyes. Then he can die in peace, knowing his son and daughter will live in peace. If we include Return of the Jedi in this equation, I say these films’ endings are equally amazing. It’s hard not to cry at the end of Spartacus because of the injustice of the whole situation. It’s a callback to the beginning of the film when Spartacus was unable to touch the love of his life or show affection the way he desperately wanted to. Kubrick really knew how to tell a devastatingly effective love story. Revenge of the Sith ends on a somber note, as well, but Return of the Jedi turns it into a triumph. It’s the best of both worlds. I hope you can now see that the Star Wars prequels could have been condensed into a single film and told in a faster, more effective and engaging way. George Lucas could have, instead, started with a film about the ancient Jedi Knights who first established the Republic and then continued with the origin of Emperor Palpatine and his rise to power. Then just top it off with the Clone Wars and Anakin’s fall from grace to become Darth Vader. If Lucas had done that, his Star Wars prequels would most likely be some of the best movies ever made and they would certainly be worthy successors to the Star Wars name. The original Star Wars trilogy was a brilliant blend of themes and ideas from a variety of films and genres, from Western to War. 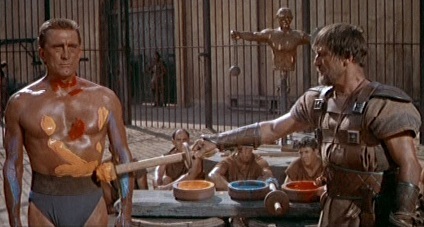 But the prequels seem to have taken most of their inspiration from a single film: Spartacus. That’s not a bad film to be based on, but the Star Wars prequels should have been so much more. All photos from the Star Wars films are they copyright of Twentieth Century Fox and Lucasfilm. This entry was posted in Movie Matchups and tagged 2001 a space odyssey, action movies, anakin skywalker, ancient rome, darth vader, drama, films, freedom, fun, funny, george lucas, government, history, humor, love, movie review, movies, obi-wan kenobi, padme amidala, relationships, return of the jedi, revenge of the sith, robocop, roman empire, romance, science fiction, slavery, spartacus, stanley kubrick, star wars, star wars prequels. Bookmark the permalink.